A few weeks ago, Kirsten emailed and suggested that we do a virtual baby shower for a fellow member of the Wish Circle who is expecting a baby boy. What a fantastic and thoughtful idea. Becky put together a mosaic for anyone who was able to participate and we planned to mail everything by May 1st so she could open all of the packages at the same time. I have been very short on time lately, but I still wanted to participate so I made a pair of pants from Lotta Jansdotter's Simple Sewing for Baby. I used kind of a crazy fabric, but I just love this print for a little boy. I also made a little knit hat. You can read more about the virtual baby shower on Becky's blog. Between everyone in our circle we have quite a few kids, but this is the first baby to be born since our circle began last year. Becky is such a great circle member and I am so excited for her! What a fantastic idea, and the two pieces you made are adorable! Cute little set! Love the pants. That is such a fun idea! 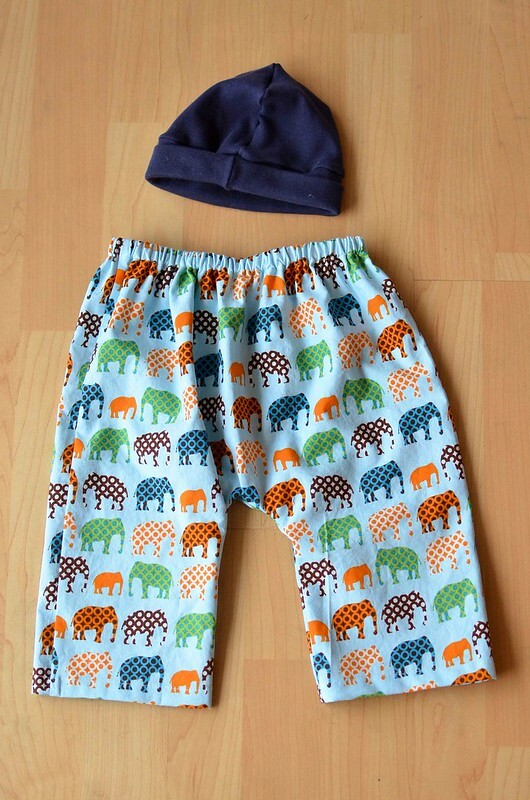 The pants and hat are very cute and I'm sure the new mom will love them!